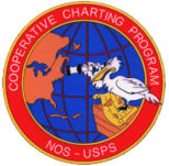 Cooperative Charting Program of the United States Power Squadrons is conducted in close coordination with the Marine Chart Division, National Ocean Service, National Oceanic and Atmospheric Administration of the U.S. Department of Commerce. The Program is a major public service of USPS. Under it, members supply information to the Marine Chart Division of NOS/NOAA leading to corrections to nautical charts, small craft charts, Coast Pilot publications and formerly, Small Craft Facilities. They also supply data on depth surveys, range status, tidal current surveys and geodetic marks and formerly, aeronautical charts. The Aid To Navigation Inspection program allows for damaged or misplaced Aids to be reported. The Adopt-A-Chart subprogram provides for individual squadrons to assume responsibility to keep a chart or a portion of a chart in their local boating area up to date and get recognition on new editions for their work. We have been told that the Cooperative Charting Program is recognized as the most effective user-participation program in all of the Federal services. San Juan Power Squadron’s participation in the CoOp Charting program helps benefit the local nautical community for everyone's safety in our waters.